I think dry season is finally coming now. The hot temperature just hit us at 31 degree Celcius in the morning, and now outside feels like 38 degree Celcius ... *phew, sweating just to take some limes in the garden. But the weather has been going crazy lately, so maybe it will be raining in the afternoon, who knows? Today I took out my large onigiri box from Sanrio and filled in with rice and decorated with Goofy. I haven't use the onigiri box lately for kids' bento. I should use it more often. In the other box : sauteed pork & onion, stir fried carrots & baby corns, sauteed chikuwa, and dried sweetened red cherries. Your Goofy is so cute Lia! Yes, the weather here is very hot too for the past few days... I misses the rain!!! Goofy is adorable, but I can't stop looking at the other food! Lia, this looks delicious!!! Yum Yum sweet bento !! In France, Goofy's name is "Dingo" ^^ Here came hot temperatures too, 15 degree Celsius warmer than last week ! @Juliglups : Thanks a lot Juli! Nice to know that Goofy has a different name in France, cool! :) We have to turn on the AC, very stuffy inside the house. this is i called that you are very inspiring me to cook and make a bento. for the 'RED' part you change strawberry with sweetened red cherries. Miss all your bentos, Lia...they are so pretty and cute. Love this Goofy..he is so adorable. Same here, the weather is so hot..we like going to melt...hehe. so nice to have the rice portion separate in this cute onigiri case, and decorated so perfectly! everything in the main box looks so delicious, especially the dried red cherries! Oh this is one I want to try for Keira this summer! She loves Micky Mouse and friends.. I love the triangular shape of the box too. So cute!! Aw, Goofy is so adorbs! And the side dish-bento... :9 oh yums.... interesting dried sweetened cherries... are they moist? I love cherries ^_^! Excellent job on Goofy, he is very cute! Cute Goofy, its good to fill the rice in the onigiri box, and have more space to fill up the yummy food in the bento box. Its Hot in the morning and Showers in the evening. and this makes the kids fall sick easily..
Aw, it sounds so hot there. It is suppose to be dry season too over here but somehow these 2 days it rains heavily! I would like to give you an award because your blog is so incredibly great. This award is given only by me, and it serves a list of the best blogs create. I hope you are happy about it. 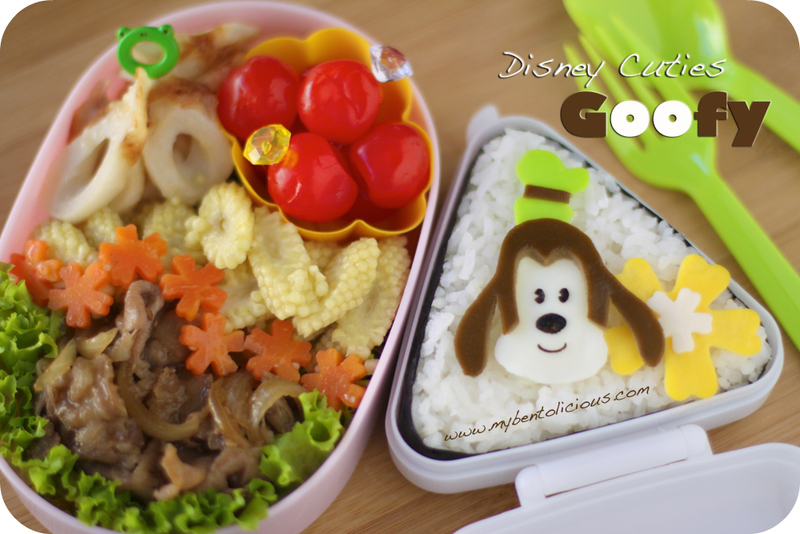 Your bento work is sooo cute! Lia, your bentos are as cute as ever. I love Goofy! He's absolutely perfect!